Prior to us becoming Earthouse Building Conservation Ltd, we were just plain old Earthouse. One of the first projects we undertook as Earthouse in 2002 was this fantastic cellar restoration. The customer rang us the other day to discuss another project at her property and when I went to visit I couldn’t resist asking for another look at the cellar! Unfortunately in 2002, I don’t think I had a phone that could take photos and I wasn’t keen on lugging a camera around building sites, so I don’t have any before photos to show you, but this is what the cellar looks like now. The cellar restoration was part of a larger project at the house. 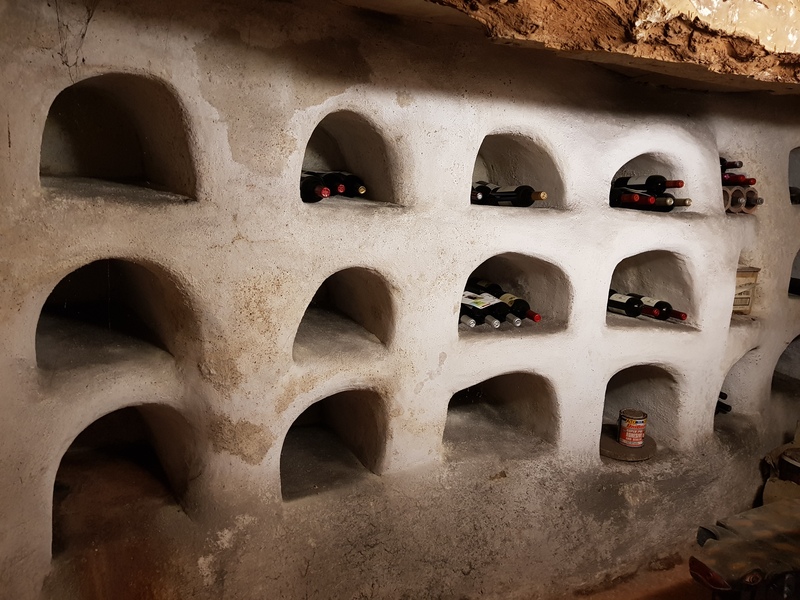 Myself and the owners were unsure of the history of the house and the reason for the niches in the cellar – was it used to store food? Wine? Someone even suggested it looked like a morgue for infants. I am not sure about this theory! As you can see the owners now use it to store wine, a great use for a unique space. For more information about cellar restoration, there is an article in the Building Conservation Directory. The niches in the cellar have been carved out of an extinct riverbed, we could see the layers of silt when we started restoring the cellar. There were a number of structural repairs we had to carry out prior to the rendering, which we did using cob blocks, lime mortar and then coated with lime render. This was then lime washed. Limewash is a great product but it does need redoing relatively regularly to keep it looking fresh and to maintain its’ protective qualities. The cellar has not been lime washed since we did the original work, hence why it is looking a little tired. We will post an update once we have carried out the new lime washing. If you have a project you would like to discuss further, please Contact Us. The finish on our house is exceptional. I was impressed with Sean’s knowledge and passion for honest restoration and the use of traditional methods. Friendly and consultative approach to the work. Delighted with every project. The quality of their work is impressive. Earthouse did an excellent job! Earthouse do a great job!